© 2013 Cyber-Seniors Documentary Inc.
Filmmaker Saffron Cassaday’s new feature documentary, Cyber-Seniors, not only proves to older generations they are never too old to learn something new, it shows teens and young adults they are never too young to make a positive difference in someone’s life. Cassaday’s inspiration for the film came from the Cyber-Seniors program created by her two younger sisters, Macaulee and Kascha. She began filming the work they did with their own grandparents and how cyber-communication changed their lives and brought them closer to family. Soon, the documentary of an initially reluctant group of seniors discovering the world wide web with the help of teenage mentors was born. The ability to stay connected online became more than just convenient, when by tragic coincidence, both Macaulee and her grandfather were diagnosed with cancer during the making of the film. The Internet became a vital artery between the two of them, who used it to Skype and stay connected during chemo sessions. Parents with their own aging parents and teenagers, she said, will certainly be able to relate to the characters in Cyber-Seniors. With the growing concern of technologically advanced forms of communications like social media and smartphones creating a more isolated, detached population, this was the case where the opposite was true. The availability of the internet helped grandfather and granddaughter connect to help make a lonely and scary situation less so. This was just one of the situations in which Cassaday explained the film focused on the positive factors social media can bring to people’s lives. Working on the film also taught Cassaday herself a few new things, including the importance of keeping up with new technology. Max, 20, watches Shura, 88, get excited about YouTube. © 2013 Cyber-Seniors Documentary Inc.
She said there is even a “generation gap between herself and her sister, who is seven years younger than her. Cassaday said it was the benefits the program had on young people while making Cyber-Seniors that really surprised her. “We knew the Internet would be beneficial for seniors, and our film proves that,” she said. “We weren’t sure however, how much the young mentors would get out of it. She thinks the young people themselves were also surprised how much they enjoyed working with the elderly. “They learned a lot, and had a lot of fun,” Cassaday said. One of the things Cassaday would like to see happen with the release of the film, is more and more people nationwide gaining an interest in the Cyber-Seniors program. Many of the communities that were able to screen the film already had programs in place or wish to start one. Hopefully, she feels, the wider release of the film will be followed by a greater number of communities taking part in the program. She said the response to the film’s website has so far been great, and encourages people interested in both the film and program to take advantage of its many online offerings. “The resources we offer on our website include downloadable handbooks to be used as teaching guides, a database to connect interested volunteers with senior residences and community centers, an informative video presentation that can played at a high school assembly to spread the word, and more,” Cassaday said. 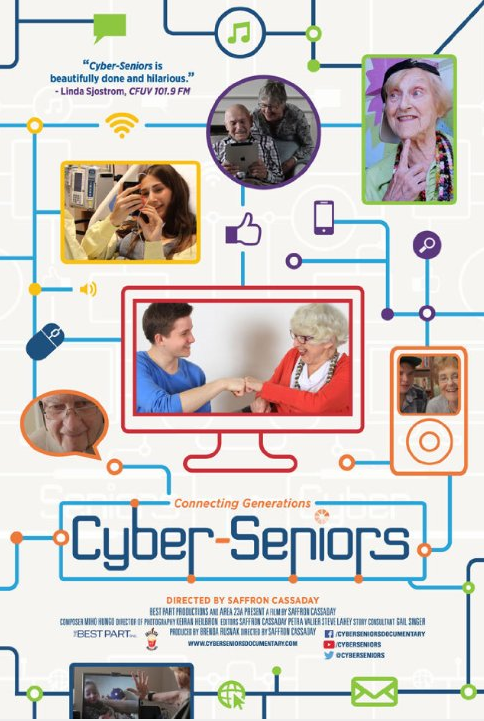 For more information on becoming part of the Cyber-Seniors program visit the film’s website at cyberseniorsdocumentary.com. This post originally ran on GeekMom.com.